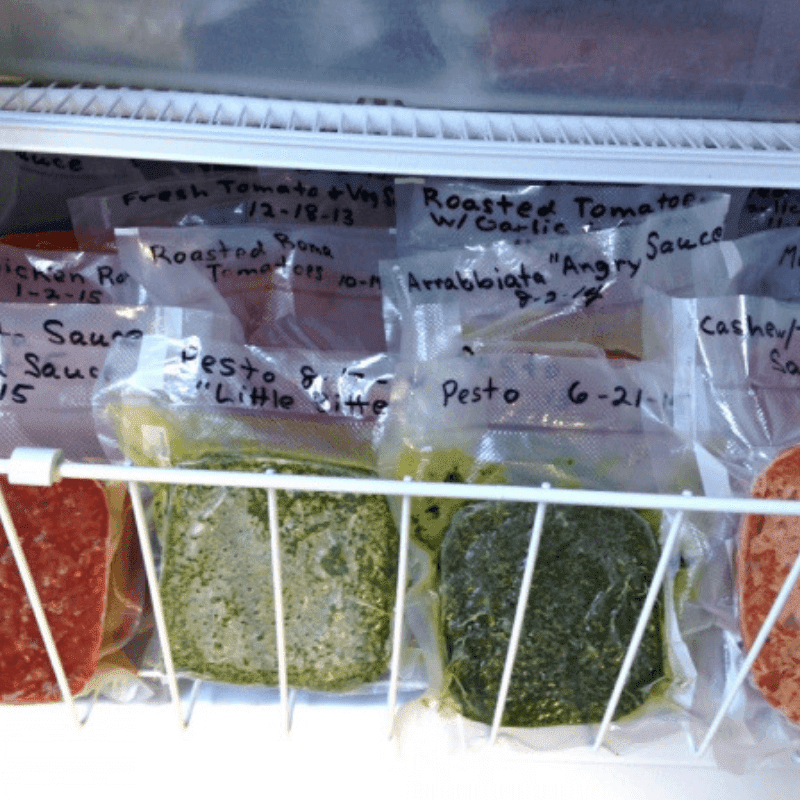 Vacuum sealers come in handy for more than just dry storage. They’re also useful when preparing food for freezing purposes. By sucking out all the air from the bag, you can freeze many different food items and retrieve their freshness for a longer period. A vacuum sealer also enables you to shop and cook your items in bulk, without worrying about the food going bad. 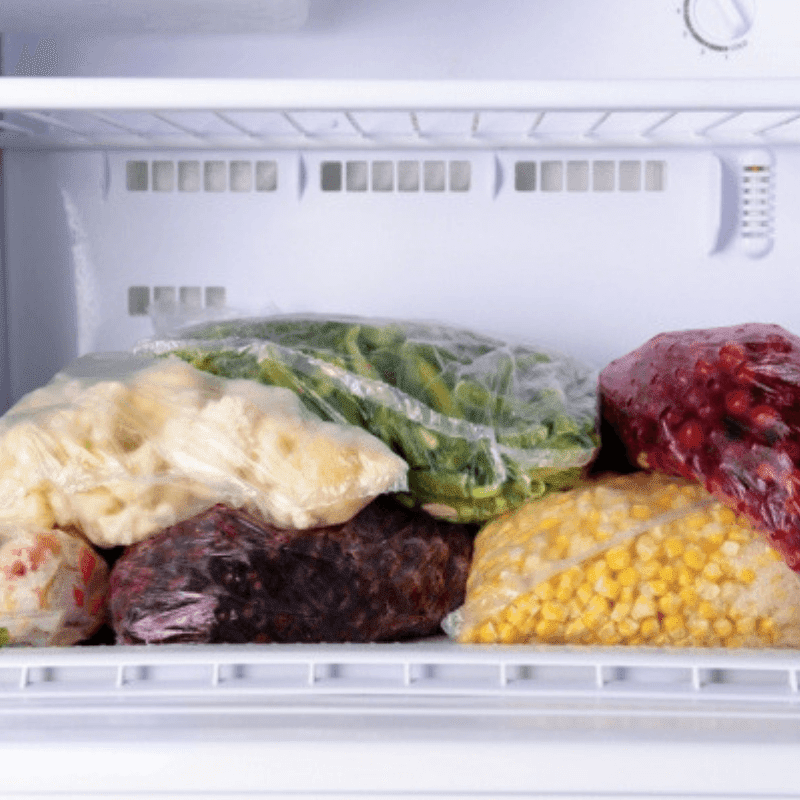 Here are 8 useful tips for freezing food using a vacuum sealer. Many food items are soft and easily squished. If you place them directly in a vacuum sealer, they may lose their shape and disintegrate within the bag. Luckily, there’s a workaround to this problem. Start by pre-freezing delicate items so they can hold their shape within the vacuum bag. If sealing fresh berries, fruits, or meatballs, spread them out on cookie sheets and place them in your freezer for a few hours. Sauces can also be frozen inside plastic containers (make sure you use a spoon to pack down the soup and remove air bubbles). After freezing, you can place the items in vacuum bags and seal them accordingly. For items that reheat well (without losing their flavor), you can cook them before sealing. Soups and sauces are good examples. Cook them, pre-freeze them in a container, and seal accordingly. For other foods such as meatballs and turkey, the best approach is to prep them for cooking and then seal them. Get the hard work out of the way by cutting meat into appropriate portions and pre-forming meatball batches. This will make it easier to complete the cooking process after you vacuum seal. If you plan to vacuum seal lots of items, labels are a must-have. You may think that you’ll remember where everything is, only to confuse your marinara sauce with ketchup. Use a permanent marker to label each bag with the correct name and date. When storing, group similar items together. Keep all your sauces in one place, meats grouped together, etc. In most cases, we tend to put fresh fruits, unused blocks of cheese, or unfinished jelly in the refrigerator. While this is a convenient option, vacuum sealing makes such perishables last much longer. The door of your fridge may be constantly opened and closed, allowing air to enter and to slowly spoil your supplies. With vacuum sealing, all air is sucked out of the packaging, keeping your items in good condition. You can also vacuum seal dry goods such as flour and powder. Just make sure these items are in their original packaging before the sealing process. Are you exploring a new recipe for enchiladas or pasta with alfredo sauce? Don’t let your creation go to waste by just making one plate. Double your dish and freeze one for later. Another good idea is to get some disposable foil pans from your local grocery store. They come in handy for placing extra portions and vacuum sealing them for a future date. Your vacuum sealer will only be as effective as the bag being used to seal food. Most vacuum sealers come with their own special bags, but you can also purchase replacement bags at many different stores. Just make sure the bags you’re using are recommended for your vacuum sealer. You don’t want air entering and spoiling your special dish, do you? Rather than freezing large portions of food, separate them into individual meal-sizes and freeze each portion accordingly. This will make it easier for you to prepare a quick meal long after the ingredients were vacuum-sealed. Smaller portions are also less likely to be penetrated with air. With a vacuum sealer, the power is in your hands. Rather than buying individually cut pieces of steak (at a higher price per pound), you can purchase larger portions and enjoy cost savings. Cut what you need to cook for the day and vacuum seal the rest. Make sure you arm yourself with proper cutlery to slice through thick pieces of meat. Another benefit of having a vacuum sealer is that you can cut portions that suit your specific needs. You no longer have to end up with unused pieces of meat (or not having enough for a meal).